The drawing for the largest-ever Powerball jackpot is tonight and many thousands of Iowans will be watching their TVs, hoping their six numbers are picked and their lives are changed. The prize of well over a half-billion dollars is bringing out droves of Iowans who haven’t plunked down two bucks for a Powerball ticket in months. 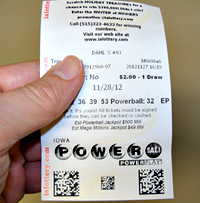 Ticket sales in Iowa alone today are expected to approach $1.5-million, as the jackpot has surged to $550-million. “Some people wait until the jackpot reaches a certain level, usually that’s over $100-million,” according to lottery spokesman Neil Watson. “When that happens, they come into the store and they buy tickets or they may start playing with a group of friends or co-workers.” Between 70 and 80-percent of Powerball players let the computer chose their numbers, but Watson says other people use their birth dates, anniversary dates or other special numbers. Those odds of winning the jackpot are more than one in 175-million. Still, some digits are played much more frequently than others. Powerball is played in Iowa and 41 other states. The drawing is at 9:59 central time.